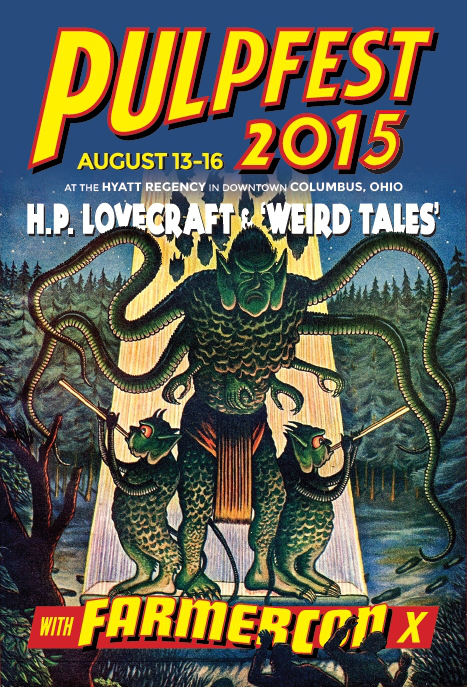 It’s a little late, but I’ve managed to get down my PulpFest 2015 convention report. As you might have guessed from the panel recordings I’ve posted, I once again attended the Summer’s Greatest Pulp Convention in Columbus, Ohio. I’ve been attending PulpFest and the convention within a convention, FarmerCon, since 2011 and I’ve enjoyed every minute of doing so. Here’s what I was up to this year. I arrived in Columbus on Thursday, October 13, 2015 a little past 10 A. M. One of the nice things about staying at the convention’s host hotel, The Hyatt Regency (located on High Street), is the parking accommodations. I parked my vehicle in the Chestnut Street parking garage, then walked over through the sky walk to the Hyatt Regency. I was able to check into my room right away. Pro-tip, if you’re new to coming to PulpFest , plug in the Chestnut Street garage’s address in your GPS. The Hyatt Regency is a huge hotel that doesn’t have a parking lot. Upon unpacking my suitcase, I discovered I forgot to pack socks. Before meeting up with the FarmerCon crew, I decided to try and find a few pairs. Alas, the hotel gift shop didn’t have any in stock. When I exited the hotel gift shop I spotted three of the FarmerCon crew, The Turks and Rick Lai. We chatted it up for a few minutes then met up with Win Scott Eckert, Christopher Paul Carey, Mike Croteau, and Chuck Loridans in the hotel lobby. Once we were assembled, we headed out to the Acorn Bookshop in Columbus. Incidentally, while we were out, I was able to grab several pairs of socks from a nearby Walgreens. The Acorn Bookshop has an amazing selection of hardcover and paperback books. I was especially impressed with the amount of sword-and-sorcery titles they had on hand. Now, when it comes to the works of classic pulp authors such as H. P. Lovecraft and Robert E. Howard, I’ve largely been a purist when it comes to prose featuring their creations. However, when one is in the company of fellow fans, whose recommendations carry a great deal of weight with me, I found myself buying some pastiche. The highlights include a large portion of David C. Smith & Richard L. Tierney’s Red Sonja novels. As far as pastiche goes, I think this was the easiest sell for me, as Red Sonja, with a “j”, isn’t really a Robert E. Howard character. For more info on that, see my Pulp Crazy episode The Sword Woman of Robert E. Howard & C.L. Moore: The Lineage of Red Sonja. The shop also had a copy of Smith & Tierney’s Bran Mak Morn novel, For the Witch of the Mists, and I added that to the pile as well. I picked up a copy of Karl Edward Wagner’s Conan: The Road of Kings, which is often regarded as the best Non-Robert E. Howard Conan story ever written. I own a copy for Kindle, but I couldn’t pass up owning a physical copy. I also purchased three Cormac MacArt novels written by Andrew J. Offutt. Offutt also wrote some cool looking books featuring his own creations which were pointed out to me by fellow convention goers at the book store. The first is a cool John Carter-like book titled Chieftain of Andor. Offut also wrote an interesting looking fantasy series titled War of the Gods of Earth, I purchased the first two books of that series, The Iron Lords and Shadows out of Hell. I’m going to keep my eyes out for the final piece of the trilogy, Lady of the Snowmist. I also purchased the first book of Offut’s collaboration with Richard K. Lyon, Demon in the Mirrior. It’s the first book in the pairs War of the Wizards trilogy. The other two books are The Eyes of Sarsis and Web of the Spider. These books feature Offut and Lyon’s red-haired sword and sorcery heroine Tiana of Reme. One sword & sorcery author that I haven’t read yet is Lin Carter, so I made sure to pick up a few of his books as well. I purchased The Dark Star and Under the Green Star. The former appears to be sword and sorcery, the latter looks to be sword and planet. I also picked up some anthologies while at the bookstore. One was Flashing Swords #4: Barbarians and Black Magicians edited by Lin Carter. I also grabbed a copy of Swords against Darkness IV edited by Andrew Offutt, DAW’s The Book of Fritz Leiber, The Shadows of Sanctuary edited by Robert Lynn Asprin (Book Three of the Thieves’ World series), and one aptly titled swords & sorcery anthology Swords & Sorcery with stories selected by L. Sprague de Camp. Swords & Sorcery contains stories by Poul Anderson, H. P. Lovecraft, Robert E. Howard, Henry Kuttner, Lord Dunsany, Clark Ashton, Smith, and C.L. More. It also has illustrations by Virgil Finlay. I was very pleased with my haul from the Acorn Bookshop and am really looking forward to diving into these. After returning to the hotel, it was time for shopping in said dealer room. This was the second year that PulpFest offered “Early Bird Shopping” on Thursday night. It’s hard to pass up getting first dibs on such a high quality and wide selection of merchandise. The PulpFest dealer room is loaded with classic pulps, hardcovers, and paperback books, along with rare original artwork and other pulp collectibles. If you’re looking for a particular pulp related book, chances are it’s going to be in the dealer room. Now I should say, I’m going to discuss the purchases I made over the course of the whole weekend. After three days of shopping, everything kind of gels together, so I can’t say for certain when I bought each particular item in the dealer room. One find that absolutely blew me away was a signed copy of The Swordbearer by Glen Cook for ten dollars. This is the paperback Timescape edition. From Pocket Books. I’m a big fan of Glen Cook’s Black Company series and I loved this particular standalone fantasy novel. It was an easy ten dollars for me to spend. Another great find was a big stack of Weirdbooks for just $5.00 a piece, which in some cases is even less than the cover price. I’ve been wanting to start collecting Weirdbook for some time and this was a great opportunity to acquire approximately a dozen issues at a more than fair price. I also purchased an issue of the sword-and-sorcery small press mag, AMRA off the same dealer. Volume 2 Number 67 which has some great Roy Krenkel interior illustrations. From this same dealer I bought a poetry book titled Myrddin Four. I believe Myrddin was a fanzine, this must have been an all poetry issue. The dealer sold me on it by mentioning it had a poem by H. Warner Munn in it. There was one dealer who had some great paperbacks that I had been looking for. The Haakon series by Eric Neilson. He had all four books and I picked those up in a heartbeat. I haven’t been able to find anything substantial online about Eric Neilson, so I’m wondering if it’s a pseudonym. Other than the four Haakon books, nothing pops up in Internet searches. This sounds like a cool series featuring a viking named Haakon the Dark being gifted a golden ax by the Norse god, Thor. This same dealer also had three newer paperbacks that caught my attention. These were three anthologies edited by Kathern Kurtz featuring Tales of the Knights Templar. It appears Kurtz also wrote two solo novels featuring the Knights Templar. These anthologies looked cool and caught my eye, so I picked them up. I was also able to complete my collection of Solar Pons paperbacks that I began at last year’s PulpFest. I picked up the final Pons books by August Derleth, and the Basil Cooper written novels that followed. I also bought a paperback copy of Thieves’ World, the first book in the Thieves’ World anthology series edited by Robert Lynn Asprin and Lyn Abbey from this same dealer. As well as a copy of Swords against Darkness, the first book in the anthology series, edited by Andrew J. Offutt. Some Lovecraft or Cthulhu Mythos related paperbacks I picked up from a few different dealers were: Tales of the Cthulhu Mythos Volume 1, Tales of the Cthulhu Mythos Volume 2, and The Lurker at the Threshold, the latter is credited to just H. P. Lovecraft, but evidently it’s a posthumous collaboration with August Derleth. I bought Tales of the Cthulhu Mythos Volume 2, since judging from the back cover text, I thought The Lurker at the Threshold was in there. I didn’t realize it was a novel. Luckily, Rick Lai told me not to worry, I had made a happy accident, as Tales of the Cthulhu Mythos Volume 2 contains all of the Robert Blake trilogy comprised of: “The Shambler from the Stars” by Robert Bloch, “The Haunter of the Dark” by H. P. Lovecraft, and “The Shadow from the Steeple” by Robert Bloch. I’ve been wanting to read these for a while. It all worked out as I was able to find an inexpensive copy of The Lurker at the Threshold somewhere else in the dealer room. I picked up two interesting looking titles from one dealer. One is called Planet of Peril by Otis Adelbert Kline. It’s a sword and planet story, featuring Robert Grandon, an Earthman who swaps bodies with a prince of the planet Venus. Naturally he finds himself in the midst of intrigue once he arrives on Venus. I also grabbed an interesting book called Lords of Atlantis by Wallace West. It deals with Mars, Atlantis, and the Titans. It sounds like a lot of fun. One dealer had several boxes of paperbacks for a dollar apiece. You had to get down on your knees and dig through the boxes, but it was worth it to uncover some interesting paperbacks. I purchased: King of The World’s Edge by H. Warner Munn, The Wizard of Lemuria by Lin Carter, Lin Carter Presents: The Year’s Best Fantasy Stories: 5, A Private Cosmos by Philip Jose Farmer, The Castle of Iron by L. Sprague de Camp and Fletcher Pratt, The King of Swords by Michael Moorcock, and The Changing Land by Roger Zelzany. I also grabbed a copy of The Iliad by Homer, translated by W.H.D. Rouse. Besides paperbacks, I also purchased some other items. I bought a handful of inexpensive pulp magazines from the 1950’s. These were pure impulse buys looking through a dealer’s $5.00 and under boxes. I just picked the covers that looked interesting. I picked up 3 issues of Fantastic Adventures and one issue of A. Merritt’s Fantasy Magazine. I don’t collect pulp magazines, as I’m more of a reader, but I can’t go to PulpFest and not buy a few inexpensive ones. While at the convention I’m always sure to pick up the latest issue of Blood ‘N’ Thunder, a magazine published by Ed Hulse. I hesitate to call Blood ‘N’ Thunder a fanzine, it just looks too professional for that. This new issue for Summer 2015 grabbed my attention with Rick Lai’s article titled The Secret Son of Bran Mak Morn. It’s a creative mythography piece in the spirit of Philip José Farmer. It’s a very interesting concept, that if you’re a Robert E. Howard fan or Rick Lai fan, it’s a must read. I mentioned FarmerCon before. This is a convention within a convention that’s comprised of fans of the late, great Philip José Farmer. The publisher of new and classic Farmer related books, Meteor House, is the sponsor of FarmerCon. They usually have at least a few books debuting at the show. If you preorder the books online, you can pick them up when you’re at the show and not have to wait for them to be mailed. This year Meteor House released: Flight to Opar: The Restored Edition by Philip José Farmer, edited by Christopher Paul Carey, Hadon, King of Opar by Christopher Paul Carey, Exiles of Kho by Christopher Paul Carey (first time in hardcover), and Airship Hunters by Jim Beard and Duane Spurlock. I’ve been talking about these books on Pulp Crazy for a while. I have it on good authority that supplies of all of these books are becoming limited. If you want to own a copy of these books, definitely head to the Meteor House website, meteorhousepress.com and get your order in while you can. I was fortunate enough to receive two books as gifts during my time at PulpFest. My friend Chris Carey gifted me a copy of Poul Anderson’s The Broken Sword, and my buddy Win Scott Eckert was kind enough to offer me a copy of Philip Jose Farmer’s Down in the Black Gang. Before I move onto talking about the programming, I should mention some items I got off the freebie or swag table. There were three issues of The Magazine of Fantasy & Science Fiction available for PulpFest attendees to take. These were the January/February, March/April, and May/June editions of this digest sized publication. I also grabbed two issues of Quantum Science Fiction & Fantasy Review from the early 1990’s that looked to contain some interesting articles. Basically picking them up on name recognition: Gene Wolfe, Poul Anderson, and Jessica Amanda Salmonson being just some of the names mentioned on the covers. One other item that I have to mention is The Pulpster. It acts as the convention magazine. Like Blood ‘N’ Thunder, I hesitate to call this a fanzine, as the production quality of the publication is so high. The magazine is edited by William Lampkin of thePulp.net, Peter Chomko is the assistant editor, and the magazine is published by Mike Chomko (who is also a member of the PulpFest committee). This year as always, The Pulpster included articles related to the convention’s themes by an array of experts. Members get a free copy of the magazine when picking up their registration packet. There’s a great Lovecraft round robin article in here that especially caught my eye. There’s also articles on Street & Smith comics and the Thrilling Group to name just a few. If you’re interested, the magazine is for sale. I’d contact Mike Chomko books for more information. Now onto the programming. This I can do day by day thanks to my handy PulpFest badge with the programming on the back. I didn’t make it to any of the programming on Thursday night. I basically shopped and hung around in the dealer room. Friday was a pretty busy day for me personally. I had a New Fictioneers reading at 1 P. M. and I was on the FarmerCon X panel at 9:10 P. M.
I’m very grateful to the PulpFest Committee for giving authors like myself the opportunity to read our work. I’d like to especially thank committee member Mike Chomko who spearheads these New Fictioneer readings. I read from “The Sword of Lomar” which was published in Swords against Cthulhu from Rogue Planet Press. It’s a prequel to H.P. Lovecraft’s “Polaris” and stars my red-haired sword-and-sorcery heroine, Nuja of Lomar. Nuja and her elite force of soldiers make a stand at the fortress of Daikos and attempt to halt the advancing Inutu army pushing towards Lomar’s capital city of Olathoe. It was a great experience and I’m so grateful to have the opportunity to read the story and answer questions afterward. I was blown away by how many people showed up and asked questions afterwards. If you were in the audience, thank you so much for coming. I don’t have a recording of my author reading, as I forget to hit record, but Christopher Paul Carey put the start of my reading up on his YouTube Channel, and Art Sippo of Art’s reviews has the entire reading and the q&a session afterwards. Art also interviewed me while we were there. The panel I was on in the evening was titled, The Weird Tales of Philip José Farmer. This was the FarmerCon X panel this year. I was joined by fellow Farmer fans, Chuck Loridans and Frank Schildiner. The panel was a lot of fun, and it was great to spread the word on Farmer’s horror fiction. Farmer is mostly known for his science fiction work (Riverworld, World of Tiers, The Lovers, The Unreasoning Mask, etc…) and his work with the pulp heroes (Tarzan Alive, Doc Savage: His Apocalyptic Life, The Ancient Opar/Khokarsa Series, The Adventure of the Peerless Peer, Doc Savage: Escape From Loki, and The Dark Heart of Time: A Tarzan Novel, etc..) but he also had a sizable amount of horror output. I have a recording of this panel up on Pulp Crazy’s channel if you’re interested in listening to it. Later that evening was a very informative panel, The Call of Cthulhu: The Development of Lovecraft’s Mythos. The panel was moderated by Tom Krabacher and featured John D. Haefele, Don Herron, Rick Lai, and Nathan Madison. One of the big things I took away from this panel was the passion of Johnathan D. Haefele in regards to August Derleth. So much so, that I went and purchased his book, A Look Behind the Derleth Mythos at the convention and had him sign it. I’ve never really given Derleth much though, but between Haefele’s book and Pete Rawklik’s recent The Lurking Chronology, I’m definitely interested. You can check out this panel on Pulp Crazy’s YouTube page. Saturday afternoon saw me attending a few panels during daylight hours. I attended Duane Spurlock’s New Fictioneers reading. Duane gave some great readings of his work, including excerpts from Airship Hunters coauthored with Jim Beard and published by Meteor House, Fighting Alaska published by Fight Card, and an all new work titled Space Detective. I have a recording of Duane’s reading available on Pulp Crazy. Duane’s reading was followed by the annual New Pulp Panel. This year it was titled, “The Heirs of Weird Tales”. As always it was moderated by Ron Fortier from Airship 27, and the authors featured this year were Jim Beard, Rick Lai, Jeff Fournier, and Frank Schildiner. The authors discussed their favorite weird tales authors, characters, and stories, and how the legendary magazine inspired their own writings. I have a recording of this panel as well available on Pulp Crazy’s YouTube page. Saturday evening brought another amazing panel, Weird Editing at The Unique Magazine. This panel was once again moderated by Tom Krabacher, and featured Morgan Holmes, Will Murrary, Don Herron, and Garyn G. Roberts. The panel focused on the editing practices of Weird Tales editor, Farnsworth Wright, and was one of the most informative and engaging panels I’ve ever witnessed. If you’re a fan of Weird Tales, you owe it to yourself to check out the recordings for this one. I have it up on Pulp Crazy’s YouTube channel. I didn’t get a chance to record all of the panel this years, but between me, Bill Lampkin at the Pulp.Net, and Arthur Sippo of Art’s Reviews, we should have you pretty much covered I think. Bill and Art both recorded a great deal of panels, and Art has some author interviews up on his site as well that he conducted at PulpFest, including me. So definitely check out the show notes for links to the Pulp.Net and Art’s Reviews for some more PulpFest listening pleasure. In case you can’t tell, I really enjoyed PulpFest 2015. I can’t say enough about it to truly do it justice, but in my opinion it’s the ideal convention. It sports an amazing dealer room, excellent programming, and the host hotel is a great place to stay. The hotel is right in the Arena District of downtown Columbus, Ohio, so there’s plenty of restaurants nearby to eat at. Not only that, but there’s a hotel food court that’s ideal for getting a quick bite to eat. I ate Subway for lunch ever day and couldn’t have been happier. Besides all of these perks, the PulpFest crowd is just full of good people. That’s one thing I’ve learned while attending these past five PulpFests, there are some great people at this convention. From the committee members, dealers, and fellow fans, I don’t know if you’ll meet a friendlier group of people. If you’re into pulps, heroic fiction, paperbacks, book collecting, or enjoy reading in general, definitely pencil Pulpfest in on your calendar every year. 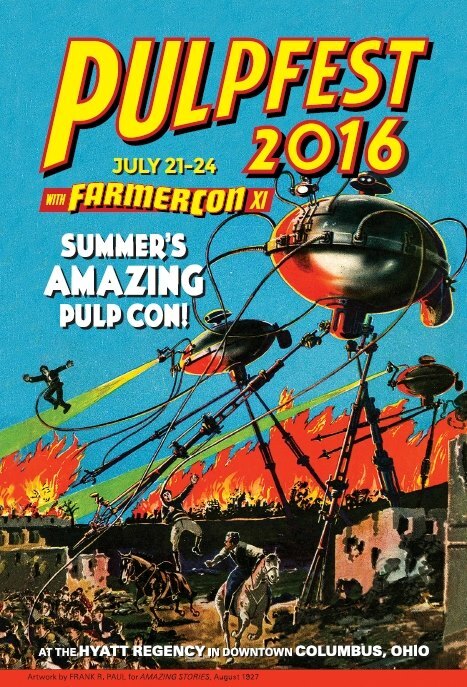 Pulpfest 2016 will be from July 21-24, and I’m sure it will keep the tradition going. For more information check out http://pulpfest.com. You can also like Pulpfest on Facebook at Facebook.com/Pulpfest and follow Pulpfest on Twitter, they’re @PulpFest. Well that’s it for my PulpFest 2015 convention report. I’m sorry it’s so late, but I hope you enjoyed hearing about my experiences and the programming I recorded.